Frontliner & B-Front - Godz Edit Powerrr! 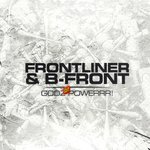 "Because of many requests, @djbfront and I decided to give away Frontliner & B-Front - Godz Edit Powerrr! FOR FREE!